[베스트 프랙티스] [GIA Insight_Intelligence Plaza] 경쟁/마켓 인텔리전스 포털은 2015년 이후를 어떻게 대비해야 하는가? 경쟁/마켓 인텔리전스 포털은 2015년 이후를 어떻게 대비해야 하는가? 기업의 다른 부서나 기능과 마찬가지로, 경쟁/마켓 인텔리전스 팀은 비즈니스 환경의 변화에 지속적으로 대응해나가야 한다. 경쟁/마켓 인텔리전스 앞에 무엇이 놓여 있을까? 미래 대비를 위해 기업의 경쟁/마켓 인텔리전스 지식 포털에 어떤 사양과 기능을 추가해야 할 것인가? Just like any function, your competitive intelligence team must continuously adapt to changes in the business landscape. What lies ahead for competitive intelligence (CI) in general? What features and functions should your team be prepared to implement in your competitive intelligence knowledge portal? The Intelligence Plaza team looked at the Market Intelligence Trends 2020 survey and picked out some interesting trends. In a survey question, Global Intelligence Alliance (GIA) asked 139 global intelligence professionals for their viewpoints on how intelligence programs need to adjust to certain trends by the year 2020. 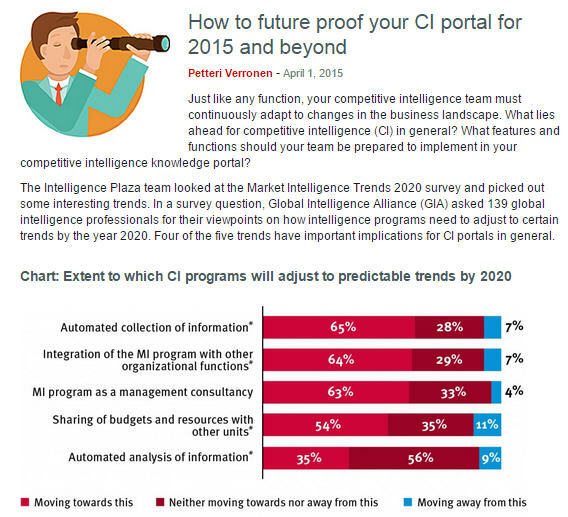 Four of the five trends have important implications for CI portals in general. Increasingly, companies must implement systems to collect information online and in real time, automatically, but this is just the first phase of building the capability to proactively identify and respond to emerging market opportunities and threats. Information management – Data should be fed into CI systems that have built-in features or with best-in-breed automation tools, that handle everything effectively and through a minimum number of different user interfaces. Effectiveness – Implementing ways to ensure the effectiveness and timeliness of the data automation is critical to its success. CI managers need to identify the optimal set of data sources and tools for their organizations, and what is the optimized level of human involvement. Integration with EWOS – Companies will need more sophisticated early warning and opportunity systems that can proactively interpret both negative and positive market signals, in the context of the company’s specific circumstances and goals, and present those through visually appealing and easily adaptable formats / user interfaces. Best practices – With the expansive range of information that can be collected, many companies find they need guidance on how to avoid overlapping activities and resources and optimize costs, such as subscription costs. Specialist service providers – Alternatively, they can take the tested option of outsourcing the management of their entire information source portfolios and the monitoring of news outlets, web blogs, websites etc., to specialists. Specialist companies can offer economies of scale and virtually endless source portfolios. Ensure you choose a partner that has the flexibility to adapt to your changing requirements. Automated analysis can certainly be used for big data and data that is quantitative. Shift in time usage – CI professionals will find their time freed up to spend more time in face-to-face meetings with decision-makers to look into the “so what” of the information with in-depth analysis and recommendations. Keeping on top of automated analysis tools – CI managers also need to continuously learn and keep abreast of the latest available possibilities and options within the realm of automated analysis stools. Here, again, partnering with a correct specialized service provider may be of great advantage. According to the Market Intelligence Trends 2020 survey, 64% of all respondents expect intelligence programs to be integrated with other organizational functions in the future. This would certainly be a positive move. Most companies today use separate systems to serve their different information requirements e.g. CRM system, CI portal, intranet, social media platforms, ERP etc.. Many recognize the need to integrate these tools – or at the very least to arrange for a single point access to all relevant systems. Careful evaluation of needs before integration – Technical integration can/should also be considered, but the level of requirement should always be evaluated carefully. Often, it’s enough to only share views or move needed data between systems, instead of implementing actual system or database level integrations, where the returns on the investment may be limited. Ensure the minimum requirements – The CI portal should always support the sharing of views or movement of data from other systems, regardless of the level of integration selected. About half of those who responded to the Market Intelligence Trends 2020 said they expect to share more resources with other departments. Shared budgets – Integrating with other units that have larger budgets at their disposal will give competitive intelligence programs the opportunity to divide some costs with these units, while sharing their knowledge and other resources. For example, CI teams may be able to leverage their IT colleague’s technology expertise, so they can focus on their core strength, providing analyzed insights to decision-makers, while providing their IT department with value-adding intelligence content to be utilized in other internal systems, as well as visibility to the best practices from the world of knowledge management and CI. Internal promotion of CI – Another benefit of sharing resources is the increased awareness of the CI program and the potential to widen the software’s user base. This may also open new possibilities for collaboration and creating virtual communities. Increased level of expectations – With a widening user base on the other hand, CI software managers need to address special requirements, such as new topics to be monitored, special data format requirements, as well as security and access control concerns There will also be a greater emphasis on the user experience, personalized views and deliverables etc. Based in Helsinki, Finland, and previously in Toronto, Petteri is Vice President of Technology at GIA. He is responsible for GIA’s global technology support, software development and quality assurance, and has helped plan, set up and roll out world class intelligence operations for leading global companies across Europe and North America. Petteri can be reached at Petteri.Verronen@globalintelligence.com or Tel +358 10 613 2000. This entry was posted in Practical ideas and tagged analysis, best practices, big data, CI software,competitive intelligence, Decision makers, information distribution, market intelligence, market signals, user experience on April 1, 2015 by Petteri Verronen.